Quick Fact 861: Play-Doh was originally used as a wallpaper cleaner, with the compound debuting 22 years before Play-Doh hit the shelves, in a last ditch effort to save a dying company, the Cincinnati based soap company, Kutol. (Wallpaper cleaner wasn’t really used much anymore as people transitioned away from coal heat.) 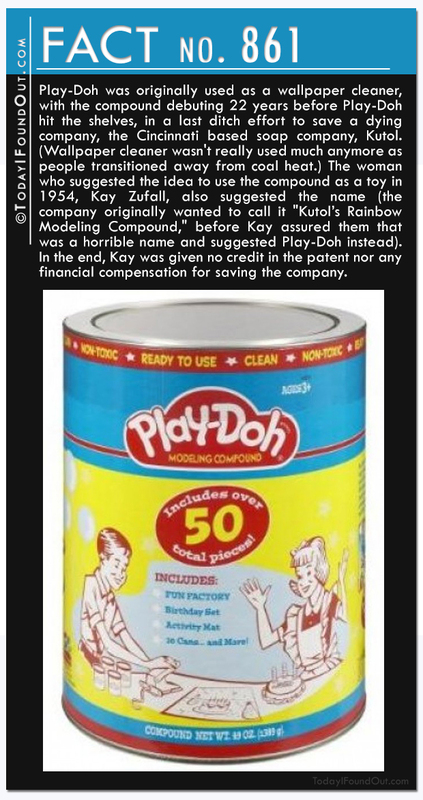 The woman who suggested the idea to use the compound as a toy in 1954, Kay Zufall, also suggested the name (the company originally wanted to call it “Kutol’s Rainbow Modeling Compound,” before Kay assured them that was a horrible name and suggested Play-Doh instead). 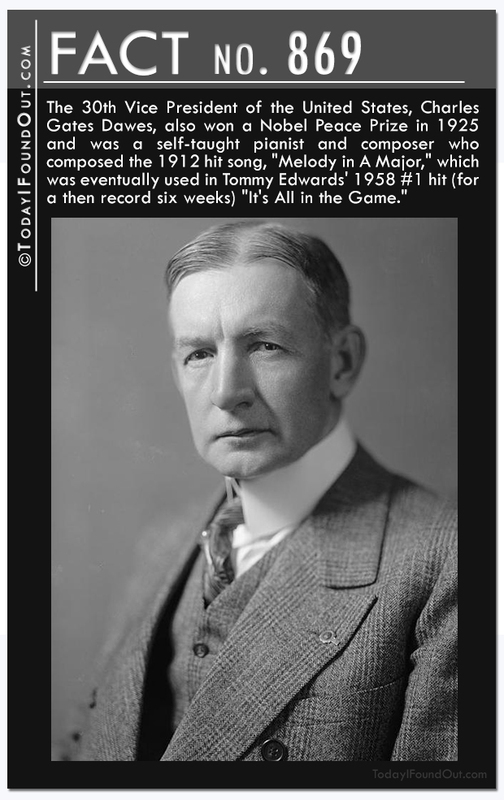 In the end, Kay was given no credit in the patent nor any financial compensation for saving the company. Quick Fact 862: Bubble Wrap was originally invented in 1957, but not to be used as a packaging material, but rather for use as wallpaper. Needless to say, it didn’t sell well, nor did their next idea to use it as greenhouse insulation. 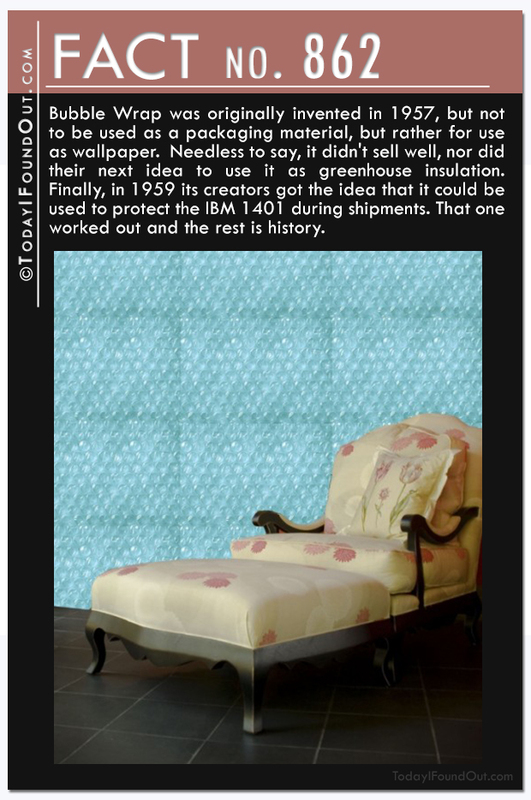 Finally, in 1959 its creators got the idea that it could be used to protect the IBM 1401 during shipments. That one worked out and the rest is history. Quick Fact 864: The oldest contender for first recorded condom use can be found in the French Grotte des Combarrelles, a cave with drawings, some 12,000 to 15,000 years old, displaying some form of condom use. 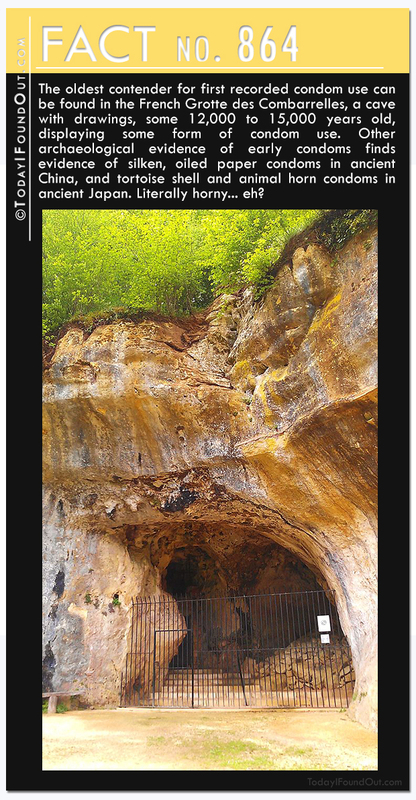 Other archaeological evidence of early condoms finds evidence of silken, oiled paper condoms in ancient China, and tortoise shell and animal horn condoms in ancient Japan. Literally horny… eh? Quick Fact 865: “Coitus Interruptus” or the “withdrawal method,” was once one of the most popular methods of preventing pregnancy (and, indeed, according to Dr. John Guillebaud in his book Contraception: Your Questions Answered, some of the lowest birth rates in history pop up in cultures who primarily used the withdrawal method). But in the last half century or so, this method has been cast aside in many cultures. However, according to research done in 2008 at the Guttmacher Institute in New York, the withdrawal method, when executed perfectly, is 96% effective for preventing pregnancy. For comparison, using a condom, when done perfectly, is 98% effective and oral contraception has a “perfect use” rate of 99.7% effective. What about in actual practice with everyday people? The withdrawal method is roughly 82% effective while using a condom is roughly 83% effective. Oral contraception, in contrast, offers a much better “actual use” rate of about 96%. 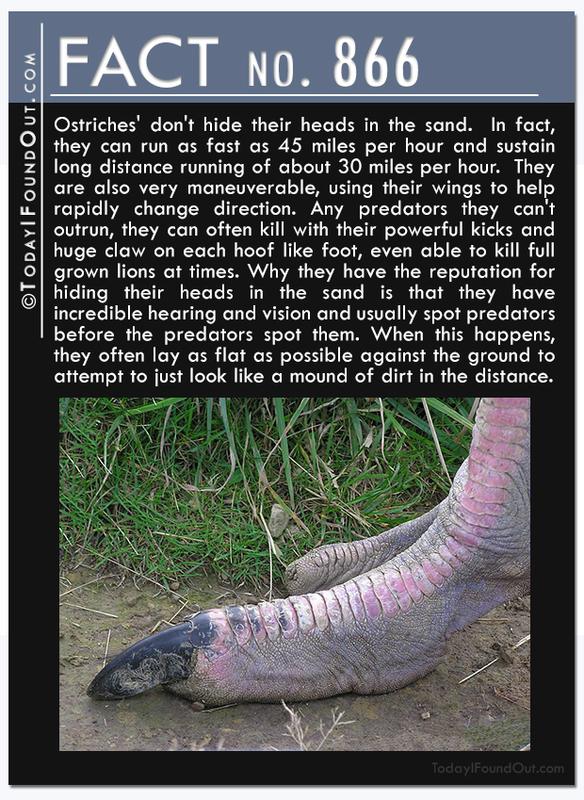 Quick Fact 866: Ostriches’ don’t hide their heads in the sand. 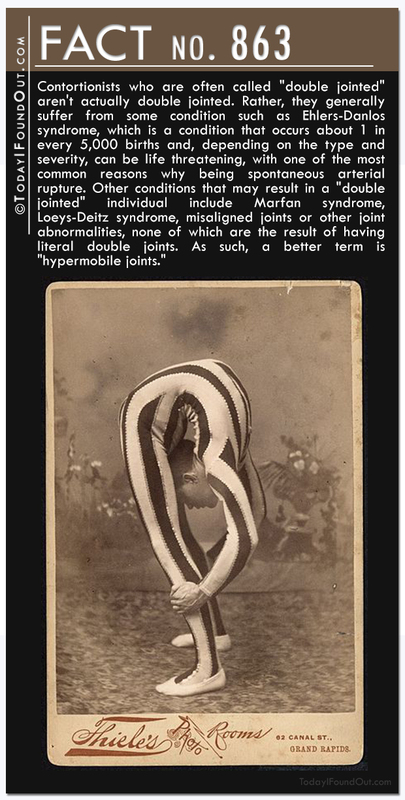 In fact, they can run as fast as 45 miles per hour and sustain long distance running of about 30 miles per hour. They are also very maneuverable, using their wings to help rapidly change direction. Any predators they can’t outrun, they can often kill with their powerful kicks and huge claw on each hoof like foot, even able to kill full grown lions at times. Why they have the reputation for hiding their heads in the sand is that they have incredible hearing and vision and usually spot predators before the predators spot them. When this happens, they often lay as flat as possible against the ground to attempt to just look like a mound of dirt in the distance. 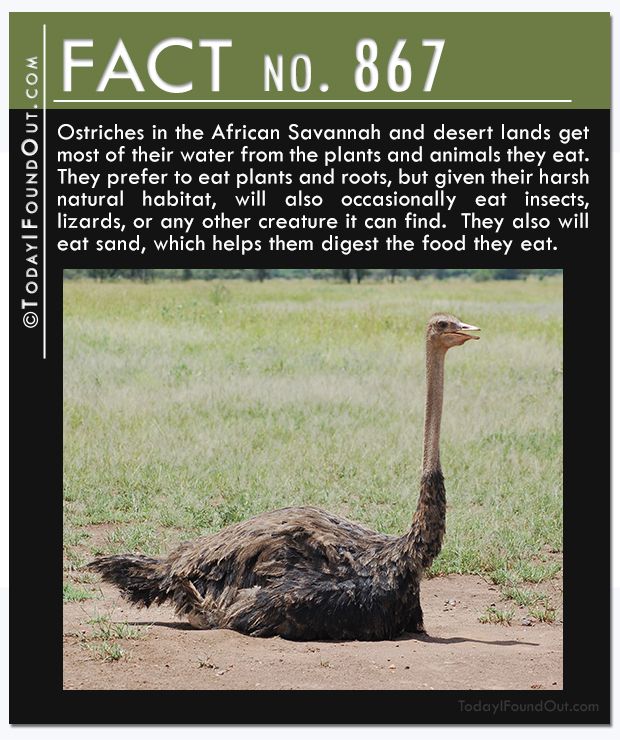 Quick Fact 867: Ostriches in the African Savannah and desert lands get most of their water from the plants and animals they eat. They prefer to eat plants and roots, but given their harsh natural habitat, will also occasionally eat insects, lizards, or any other creature it can find. They also will eat sand, which helps them digest the food they eat. 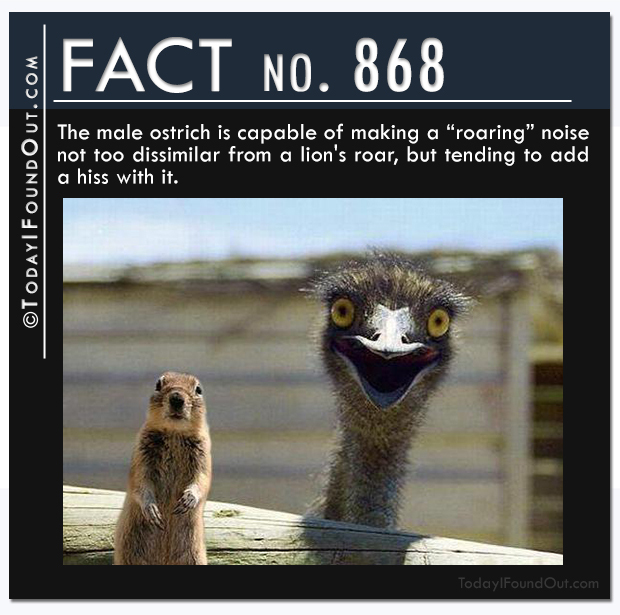 Quick Fact 868: The male ostrich is capable of making a “roaring” noise not too dissimilar from a lion’s roar, but tending to add a hiss with it. 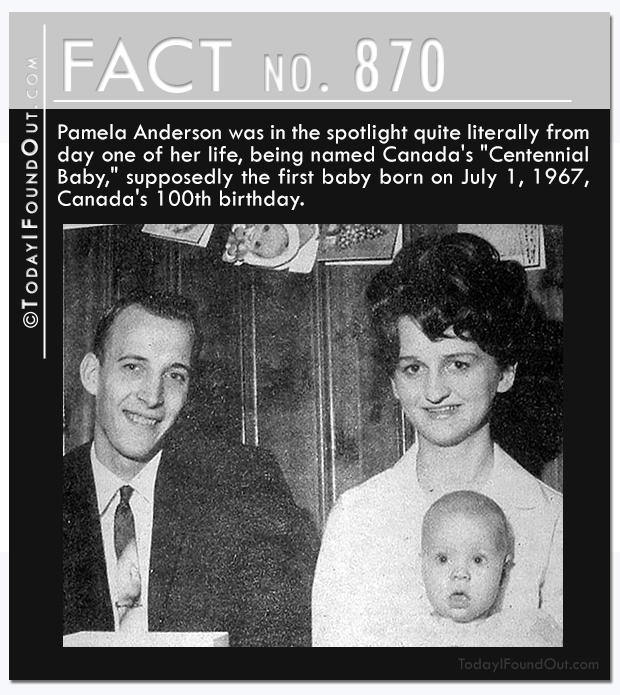 Quick Fact 870: Pamela Anderson was in the spotlight quite literally from day one of her life, being named Canada’s “Centennial Baby,” supposedly the first baby born on July 1, 1967, Canada’s 100th birthday. I think that ostrich pictured in Fact 868 is actually an emu.